With the weather warming up and the snow disappearing from the mountain tops, the Cairngorms National Park is the ideal place to spend your family time. Whether jumping into pools at the bottom of a waterfall, exploring a historic property, climbing a Munro, taking a stroll around a loch by horseback or simply sitting and taking in the views, the Cairngorms has something for everyone. So, all in the name of research we headed out to experience the very best of the summer activities in the Cairngorms National Park. River tubing comes from North America where people relax and enjoy the day floating down a mellow river. Which is fun but the Cairngorms National Park has some amazing mountain streams with fun rapids, stunning scenery and so the trips are an equal mixture of mellow and exciting all in one super fun activity. River tubing on the River Spey is fun for all the family. 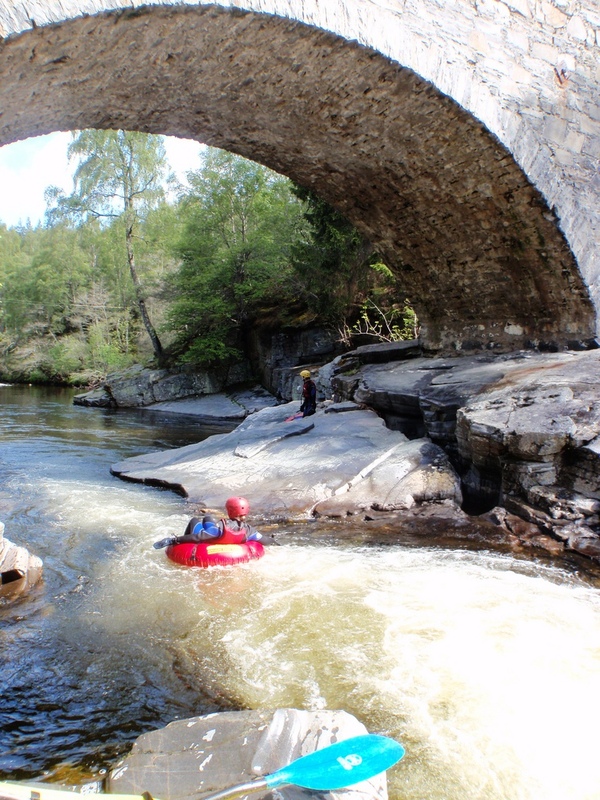 Wearing a full wetsuit and sitting on the specially designed river tube with padded seat, you can chose to drift serenely along on the calm river through the ancient pine trees of Rothiemurchus forest or hit the exciting natural water shoots and rapids. How many museums in the UK are FREE all year round? Well the Highland Folk Museum is! This open air 80 acre “living history” attraction is a perfect day out for the family taking visitors through life in the Highlands from the 1700s to the present day – with an old fashioned sweet shop and a 1920’s school with lessons and fun games taking place throughout the day. With some of the most beautiful lochs in the country all situated in the Cairngorms National Park, and one particular favourite – a golden sandy beach in the mountains – there are plenty of places to take up sailing or windsurfing. Many of the activity providers provide expert tuition in both sports, allowing you to progress safely and rapidly in your chosen sport. Loch Morlich and Loch Insh both boast dedicated water sports centres. The perfect activity for all the family no matter what your age or experience – what better way to enjoy yourself and learn a new skill into the bargain!? The Wild Farm Walk goes on a tour of the estates unusual Highland Farm near Tomintoul, where the herd of Reindeer who are part of the now famous Cairngorm herd spend their summer months. Also on the farm, herds of beautiful Fallow and Red deer graze, a flock of tiny Soay sheep roam and Wild Boar root for their food. Although the Red and Fallow deer and Soay sheep are timid by nature they will come to feed close by and in contrast the Wild Boar are always very bold, noisy and very hungry. Finally the reindeer always love the food brought to them and are a joy to hand feed with their soft velvet noses. Everyone enjoys the hands on experience with the reindeer. Tours leave from the Glenlivet Estate Office at the south end of Tomintoul. There are a host of riding schools throughout the Cairngorms National Park that offer lessons, treks and even trail holidays – perfect whatever your age or ability. Pony trekking is said to have started in the Cairngorms, with the sturdy Highland ponies that work alongside stalkers, carrying deer off the hill, and now these sturdy (yet friendly) beasts allow you to explore the stunning countryside at a gentle pace. Blair Castle is one of the most striking Highland Castles as the whitewashed walls sit splendidly against the lush green trees that surround Highland Perthshire. One of the first private homes to open to the public in Scotland, Blair Castle is an Aladdin’s Cave of history and Highland culture and on your visit you can take in a tour of 30 rooms and the fascinating collections they contain. Whilst there take advantage of discovering the Castle’s secrets by booking onto an attic tour. Hidden from view in the attic maze of rooms and corridors are many strange, wonderful and interesting artefacts that tell even more of the story of the castle’s chequered past. Step back in time and visit Braemar Castle – one of the most spectacular castles in Scotland. You’ll be able to Hear stories of the colourful characters associated with the castle, find out how Clan Farquharson began and discover the part played by Braemar Castle in the story of Scotland. Whilst there be sure to keep a look out for red deer, red squirrels, golden eagles and, if you’re very lucky, the elusive capercaillie. Run and being lovingly restored by the Braemar Community, the Castle is a secret gem not to be missed. Braemar Castle really looks like it could have stepped out of an animation – truly magical! So, why not Make It Yours this Summer and ensure you try something new in the Cairngorms National Park?